Vibrant scraps of reclaimed saris are sewn together then twisted to create a dramatic, rippled scarf. "Up-cycled" from vintage saris in India, this gorgeous scarf is a patchwork of rich, warm-colored pieces of luxurious silk. To make the scarves, individual saris are cut into strips and hand stitched together with others to create a vibrant blend of color. The scarf is then moistened, tightly twisted, and wound around a bamboo pole, creating a beautiful, rippling texture as it dries. Each scarf has unique variations in its pattern and colors, and can be worn wrapped around the shoulders or head. Handmade in India from 100% recycled materials. Click here to view a video of how the sari scarf is made! Click here to see all sari scarf colors available. Hand wash or dry clean. When storing, twist and knot to keep crinkle. I really love this scarf. It's beautiful and I love the story behind it. I'm sad that after hand washing, it developed some holes. I'll still wear it because it's my favorite, but it's disappointing. 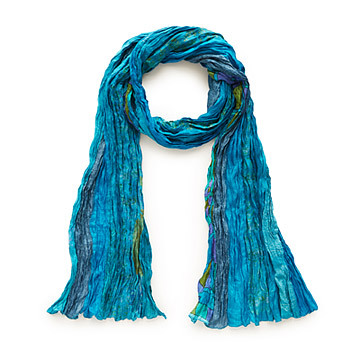 This scarf is very pretty and will be the perfect accessory for many outfits in most seasons. Gorgeous scarf! Unique! One of a kind! This is the perfect scarf for someone who likes to dress well. It is lightweight. It doesn't wrinkle because it has natural folds. The material is shiny and soft. I love the weight and the feel of it, as well as the striking turquoise/blue colors. This is a great scarf to throw on to dress up any outfit. Jeans and a t-shirt look like it came out of a fashion magazine with this scarf tied on. I am not using it, as I bought it as a gift. Dresses up a casual outfit and adds color to a monochromatic one. This scarf had all the colors that my friend loves. She wears it frequently. My daughter loved the scarf and the story behind it.